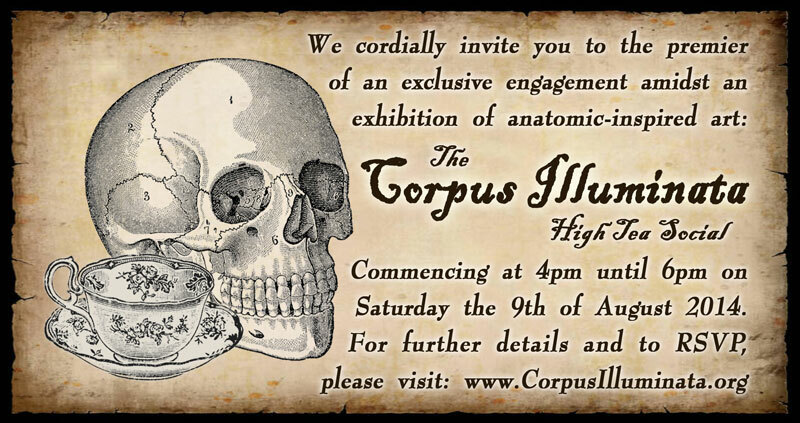 Corpus Illuminata cordially invites you to the premier of an exclusive engagement amidst the gallery of art…the Corpus Illuminata High Tea Social. Commencing at 4pm until 6pm on Saturday the 9th of August, this private affair will include a delicious assortment of finger sandwiches (some vegetarian), desserts and hot teas. Fancy dress is encouraged and ages 12 and up are welcome to this stylish event. Only 20 seats are available and admission is $20 via RSVP only, which also includes entry to the Corpus Illuminata exposition afterward. UPDATE: With apologies, the High Tea Social has be cancelled, but will return next year. Corpus Illuminata is a trademark of That DAMNED LLC. 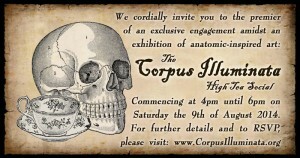 All Content and Images © Corpus Illuminata. All Rights Reserved.